Despite Sears’ recent struggles, developers are eyeing the company’s former properties as major opportunities. 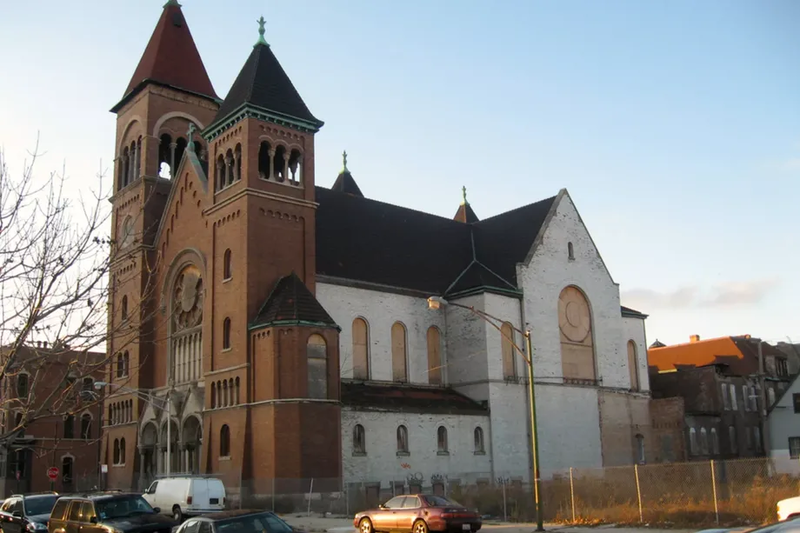 Last year, Springbank Real Estate Group acquired the vacant Sears at 1900 W. Lawrence Avenue in the Chicago’s Lincoln Square neighborhood and plans to transform the 1920’s era structure into 59 apartments, 91 parking spaces, and 30,000 square feet of commercial space. 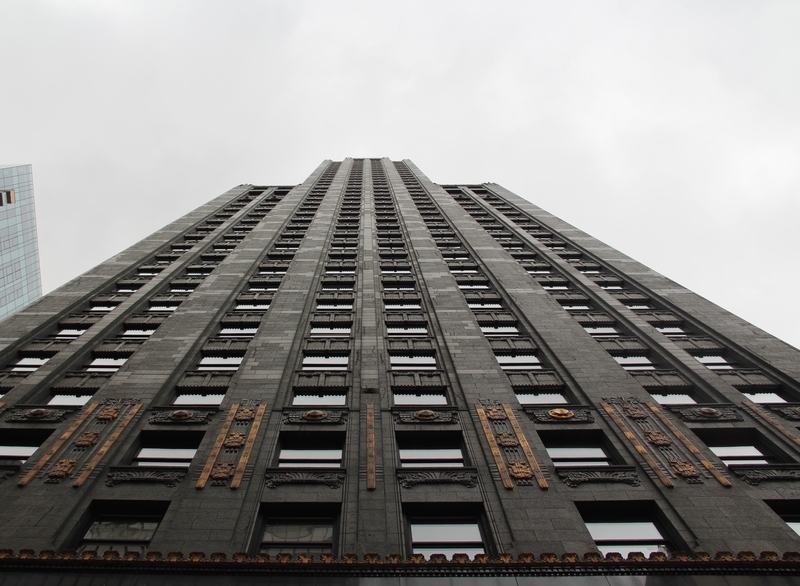 The Art Deco Carbide & Carbon building in Chicago..
Ward explained how many of the city’s storied buildings, from the Chicago Motor Club to the old Chicago Public Library, still exist today with many of their original features and design elements preserved—even though the structures themselves have been renovated for new purposes. The most dense and vibrant neighborhoods in Chicago tend to have a great stock of historic buildings. Many of these are heavy-timber construction and are literally irreplaceable. Large, monolithic office buildings are cool, but it’s best when they are balanced-out by smaller, historic buildings that feel more accessible — it helps creates an attractive contrast. This mix is an important urban planning principle, and a major factor when we seek out up and coming neighborhoods. In terms of large-scale adaptive reuse opportunities, there is a limited supply and a lot of demand in the developer submarkets, so the footprint will continue to expand. We believe Goose Island buildings are some of the most unique and best located remaining opportunities for adaptive reuse in Chicago. Earlier this year the Chicago Department of Aviation changed the size of banner advertisements allowed at Chicago O’Hare, which meant that more than 20 United banners were unusable. Our Eco-Skies team saw this as an opportunity to “upcycle” the materials rather than throw them away. The practice of upcycling allows us to repurpose materials in a creative way to create something truly one of a kind. via United Hub – Travel in sustainable style with a United upcycle travel bag – News. The finished product is a hotel that pays homage to its past while feeling very modern and new. Many of the building’s elaborate architectural details were preserved, as the ornate millwork and tiled floors throughout the interior and the stained glass and cast-iron exterior relief have all been restored. via A Tour Through the New Chicago Athletic Association Hotel, Now Open Today – Hotel Boom Town – Curbed Chicago. Dunn, a longtime Hyde Park resident known as the city’s “zero waste man” is preparing a historic streetcar garage and six-acre land at 93rd Street and Drexel Avenue to become the future home to the Creative Reuse Warehouse, an urban farm and commercial kitchen, composting center and a place to take and store the vast shipments of unsellable food products that come through Chicago—what Dunn estimates at 600 tons per day. via Zero Waste Champion Eyes Historic Streetcar Garage Site For Big Sustainability Project: Chicagoist. Using the 1K Fulton building and renovation of the Montgomery Ward building on the Chicago River as examples, the discussion explored how industrial re-use allows the city to preserve historic building stock, gives tech tenants the massive floorplates, flexible floor plans and character they want out of their commercial space, and bring development and jobs to the city. 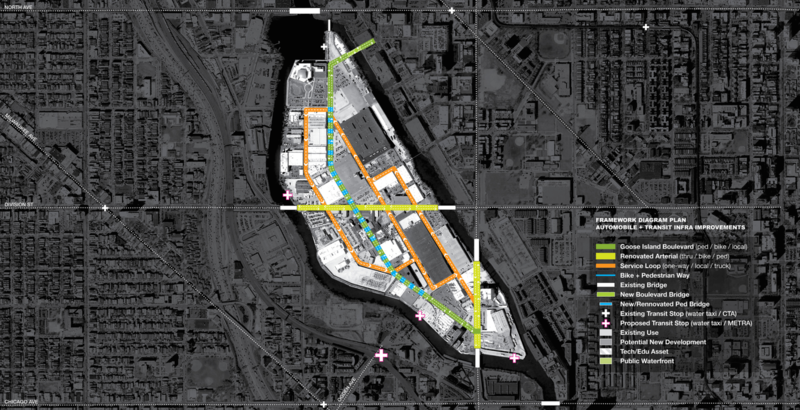 via CAF Talk Covers Industrial Reuse and Future of Fulton Market – The City that Works – Curbed Chicago. She met with the Olson Kundig team and expressed her desire to preserve the essence of the old structure but restore it to a degree that allows for a sleek modern interior to be housed inside it. via Sarofsky’s gorgeous studio office space is nestled within a charming 19th century building SarofskyStudio Olson Kundig Architects – Inhabitat – Sustainable Design Innovation, Eco Architecture, Green Building. 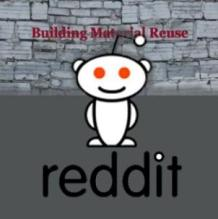 via One of the largest reusable building material retailers in Chicagoland opens in Maywood | Articles | News | ForestParkReview.com. 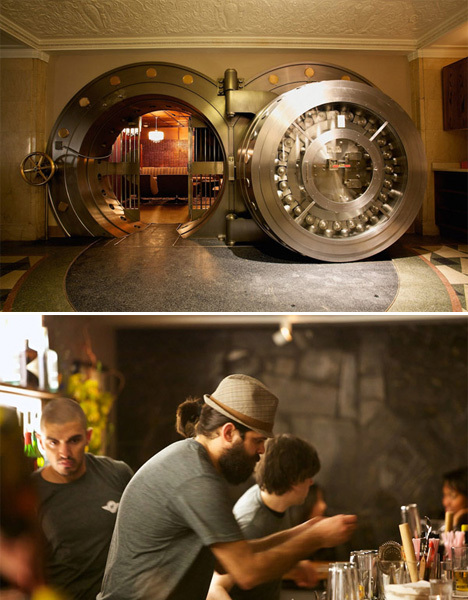 A beautiful 1926 bank vault in Chicago with many of its historic features still intact – including that incredible door – is now known as The Bedford, a local kitchen and bar serving food and cocktails in a signature mix of German and Southern cuisine. via Holy Beer: 12 Pubs Converted from Churches, Urinals & More | Urbanist. Part of the challenge will be tracing the ownership of such properties and taking the necessary steps to be able to demolish them. via Treasury Dept. 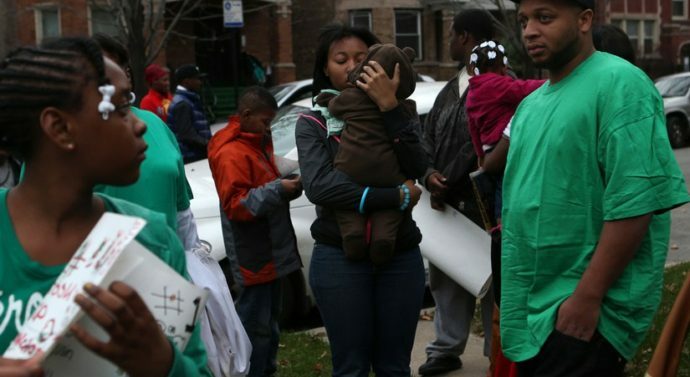 to help demolish Illinois’ vacant, blighted homes – Chicago Tribune. 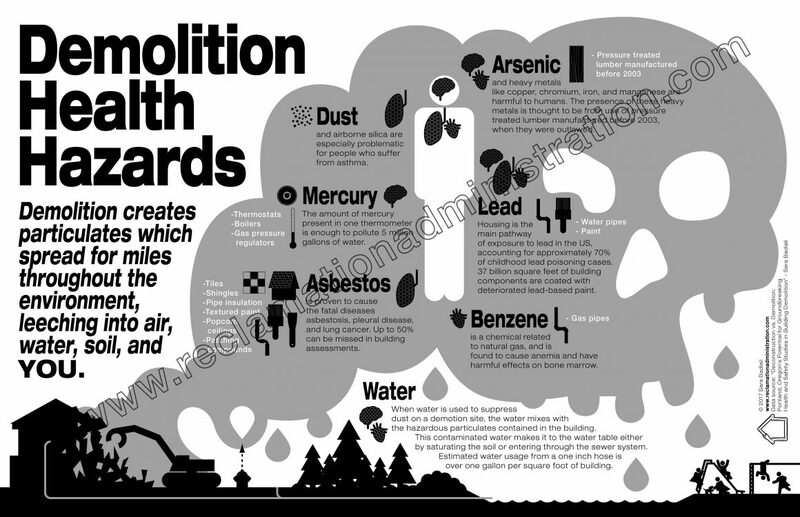 via Entering the mix – CDR – Construction & Demolition Recycling. Finkelman said the idea was to incorporate architectural elements from the original design, pay respect to the intent of that structure and enhance it wherever possible. via Adaptive reuse goes Bohemian at Thalia Hall | The Chicago Architecture Blog. We would like to thank Robert Champion for sharing his wonderful pallet tables. Robert is in the Chicago area and in need of metal frame bases for his tables. If you are a welder/fabricator or know someone who is, please contact Robert at robert.champion.melts.face at Gmail. Robert we wish you the best of luck in your search! An intriguing if not creepy, history lesson on Chicago’s historic underground tunnels. Urban Ghosts has the story and the eerie photos – go learn something! In 1899, Illinois Telephone and Telegraph laid telephone cables through Chicago by building a network of underground tunnels. A narrow gauge railway was laid to assist with excavating the tunnels and installing the cables but the system was quickly adapted and used as a means for transporting freight between public stations, basements and elevator shafts. via Chicago’s Historic Underground Freight Railway Network | Urban Ghosts |. 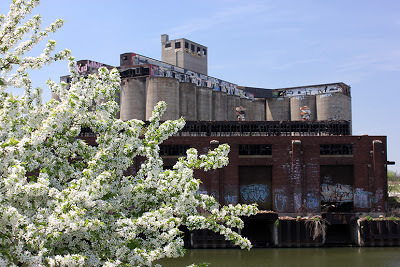 Today, in Buffalo and elsewhere, huge, abandoned grain elevators litter the country. Some have been converted to other use. 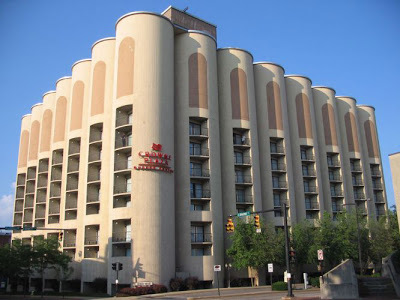 A 36-silo elevator in Ohio was bought by the University of Akron in 1975 and converted to Akron Quaker Square, complete with a Crowne Plaza Hotel. via ArchitectureChicago PLUS: The Power of Uselessness: The History – and Potential – of Chicago’s massive Santa Fe Grain Elevator. Starting to spot a trend in architectural salvage stores moonlighting as wedding venues. It is both unique and romantic, not to mention it covers the “something old” requirement. via Collecting Forgotten Tales: The lost worlds of architectural salvage : Home & Garden. It could be argued that most building materials are recycled: wood, brick, and stone, after all, are just reuses of other materials. 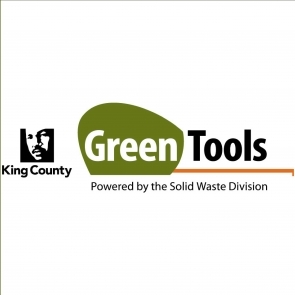 But today, driven by economic and environmental forces as well as aesthetic considerations, builders are experimenting with a wide variety of recycled and reclaimed materials – wood used in previous buildings, discarded shipping containers, cans, bottles, tires, and phone books. 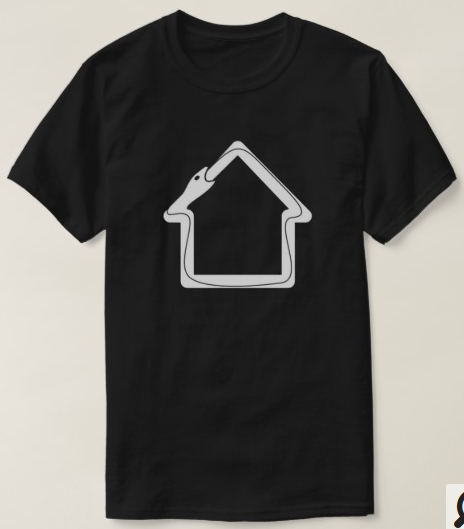 Many modern buildings make use of just about anything that might provide shelter, insulation, or decoration. 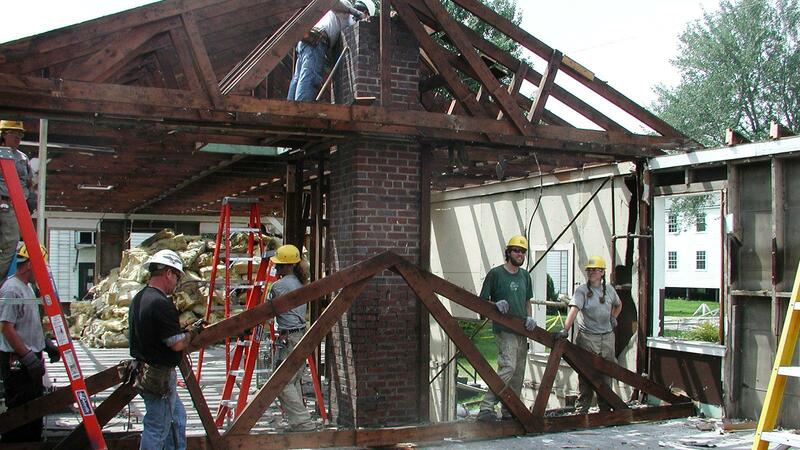 via Recycled Building Materials | WTTW Chicago. If you live or are visiting Chicago, don’t miss Apartment Therapy’s article on salvage. 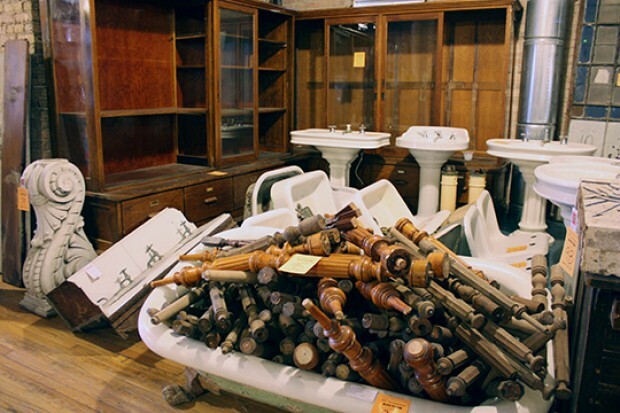 Architectural salvage shops are increasingly popular destinations for designers, collectors, and remodelers, and for the home decorator looking for unique furnishings, there’s no better place to start a search. In part, salvage stores hold such wide appeal because the items there carry the forgotten tales of the past, and invite collectors to imagine creative reuse ideas. Additionally, reclaimed objects and materials are greener and often more durable, which appeals to buyers’ practical sides. via 4 Sources for Architectural Salvage in Chicago | Apartment Therapy. CHICAGO CBS – As a Cook County judge granted the former Prentice Women’s Hospital building a three-week stay of execution, the Chicago Architecture Foundation opened an exhibit that features more than 80 designs that would preserve the structure. Northwestern University spokesman Alan Cubbage has said that the university can see no way in which the existing Prentice building could be incorporated into the medical research facility it intends to build on the site, at 333 E. Superior St.The Chicago Architecture Foundation, Chicago Architectural Club and the Chicago Chapter of the American Institute of Architects disagree. A design competition that would re-use the 1975 Bertrand Goldberg-designed building drew entries from 71 individuals or teams. Ten architectural firms and renowned architect Jeanne Gang also were invited to submit designs. via Architecture Groups Offer Ideas To Redesign, Reuse Prentice Hospital « CBS Chicago. Chicago-Area Historic Mansion Open for Salvaging Saturday, Sept. 8. In March, an historic, 9,000-square-foot mansion near Chicago sold for $4.58 million, down from its original asking price of $7.5 million. Saturday, it’ll be stripped of its architectural elements in preparation for demolition. ChicagoMag.com is reporting this morning that the 18-room, 1896 mansion in Glencoe, Ill., will be open to the public this Saturday for an architectural salvage auction conducted by Murco Recyling, Inc. Jodi Murphy of Murco says that everything in the mansion that isn’t structural is available for auction, including the landscaping. Murco’s website lists these items as just a small selection of what’s available: miles of aluminum fencing; antique wrought iron window boxes & balconies, copper gutters, slate roof, paver driveway. 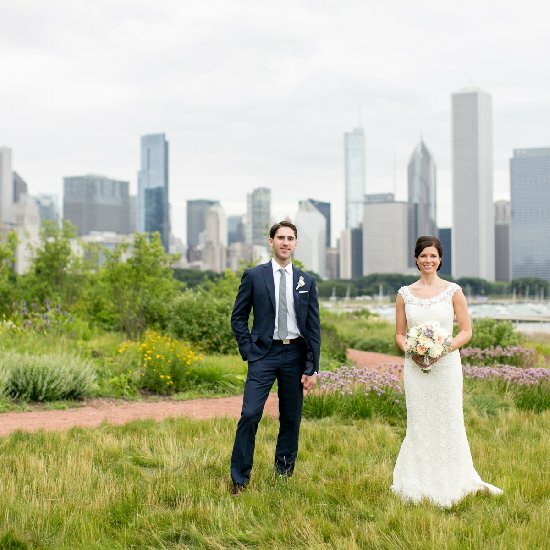 The home, which began as a smaller farmhouse, was once owned by a Chicago Tribune executive. It features a mix of antique architectural elements – such as hand-carved woodwork – as well as newer features, including a kitchen with an estimated $60,000 worth of appliances. A remarkable food production plant is being assembled in a former meat processing facility in Chicago. It’s remarkable because the waste from one type of food becomes the raw material for another. So “The Plant” will be producing Kombucha tea, fresh vegetables, tilapia, and beer…with virtually no waste! via The Plant: My Beer Feeds Your Fish! – YouTube.